Running a stream, I’ve constantly dealt with trying to find the best way to both play and capture games from all different consoles. It’s tricky because sometimes you can capture something perfectly and it looks great, but it creates display lag which makes playing the game less fun and way more difficult. Other times, the game plays great, but the capture looks horrible. Finding a balance has proved to be quite a challenge, but we’re constantly improving our setup. Now, with 2015 approaching quickly, I’m happy to announce I’ve figured out a solution to a problem that was making our games look pretty terrible. On some screens, it isn’t too noticeable, but on other screens (especially when there is a large amount of white on the screen), it is just awful. On our recent Christmas stream, we ran into this problem quite a bit in Super Mario 64. The Star Selection screen looked awful to the point where the stars were just dots. The screen flickered constantly between screens and in the clouds. It was just unacceptable, so I was determined to find a way to fix it. Luckily, I did! 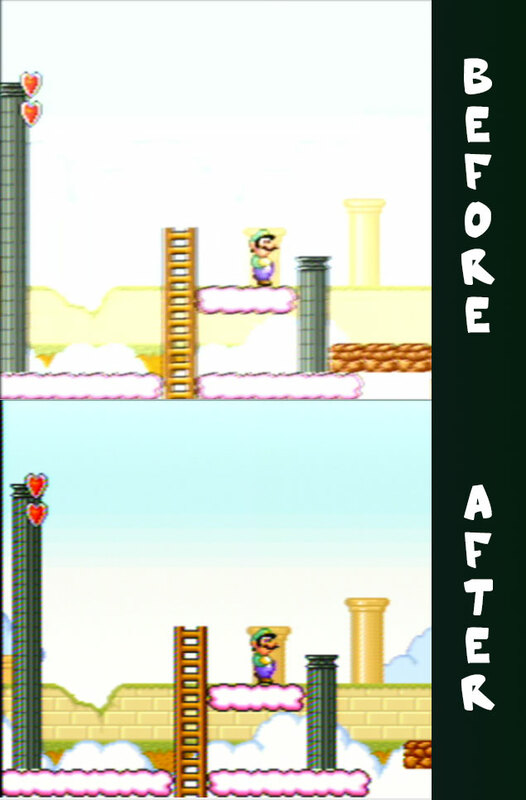 It was just awful looking before, and now you can see all of those rich colors that Nintendo intended for you to see. Interesting how it was mostly Mario games that caused problems, right? For those who are curious, I initially thought the problem might be caused by a faulty cable, but brand new cables did not resolve the problem. The weird thing was that the game looked pretty great on the TV, just not on the capture card. So I thought maybe the capture card was the problem. I hooked the game up to the capture card directly, instead of through the distribution amplifier I was using to split the signal to the TV and capture card, and it fixed the problem. So that was out. It didn’t seem plausible that the distribution amplifier was the problem because it was creating a nearly perfect image on the TV, but alas, that is exactly what it was. I invested in a higher quality amp that promised a 1:1 ratio and it lived up to its promise! As simple as swapping that out sounds, it was all that needed to be done to completely fix the problem. And so going forward, 2015 will bring some great looking streams directly from the original consoles without emulation for the first time ever, and I am extremely excited about that. This will be the closest thing to perfection we’ve seen here as far as finding a balance between quality of control and quality of visuals. Here’s to a great upcoming year ahead!